My second attempt. Much progress since my last post and this image is a combination of a surface and prom avi files. Captured with my LS50-B600 and ASI178MM. Exp 0.86 ms, gain 79, 2080x2080 for the surface and 31.9 ms, gain 79 for the proms. Stacked in Autostakkert 2.8.6 using 25% best of 500 frames, RS6 for wavelet sharpening and Gimp for image processing. 1) A youtube video that somebody had posted in my previous thread mentioned gamma of 1 for surface and 99 for proms. My control panel in SharpCap did not have a gamma control. Is that not available on all cameras? 2) You will notice that the disk edges are brighter than the center. My understanding is that this is reversed. As the previously-mentioned video suggested, I merged the layers using the "difference" method. Was this the problem? When I look at the original files out of Registax, the perimeter did not seem bright. 3) My stacked avi for the prominences actually had much less detail than a single frame capture so I used a single frame in my final image. 4) I had a very hard time matching the disk sizes of the two layers and had to resort to a quarter disk crop. I tried adjusting the prom layer size up and down by 1% but couldn't quite get it to match. 5) I know there was also a small prom around 7pm that was visible in the eyepiece but I failed to capture it. Did anybody see anything else that I missed? Please comment on ways to improve my technique. I know I have a long way to go but I am pretty please with this so far. 1) Gamma is disabled in the SDK for ZWO cameras in the latest SharpCap versions, by ZWO (not by SharpCap). You can use FireCapture to get it back instead. Or, use an older version of SharpCap prior to the update. I moved to FireCapture personally after the updates and simply keep an older version of SharpCap. 2) The image is inverted, which is the intended look in that tutorial you used. You did it right, if you want an inverted looking disc like this. 3) The seeing is the culprit. 4) As long as its close, it'll work. I think you did fine! 5) Use Shadows/Highlights to pull up the prominences. 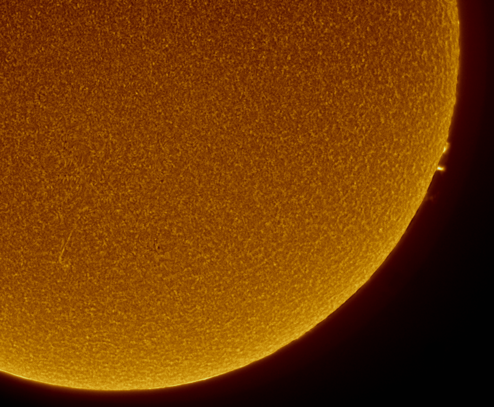 You can also dodge/burn the prominences to bring them up manually too. Thanks Marty, You are always such a huge help. Much appreciated. Looks good Dave, and Marty has given you some good pointers.